The Alienator tab in the SciFi Plugin allows you to transform your voice into a disguising voice or even alien sound. This effect has been used in many different movies and PC games in varying degrees. Some examples where this effect has been used are Wrom: JPHSCRTNHGSWZIDREXCAXZOWCO Phantom Menace, Return of the Jedi, and Freespace 2. The frequency used to change your voice. Lowering the frequency has an effect of adding a "beating" to your voice. The higher the frequency, the more unintelligible your voice becomes but has an interesting effect. Sets the squelch. The squelch is a specified power threshold in which the effect is not applied to your data if the squelch is not met. The higher you make the squelch (i.e., the less negative the number is), the more of the signal is passed unaffected by the applied effect. For example, if you have some background noise in your voice, you can adjust the squelch so that the effect is applied to your strong sounding voice but is not applied to the lower background noise. Squelch is specified in dB. A value of 0 dB corresponds to the strongest possible signal, and -90 dB is the lowest possible signal. For normalized voice files, the power values for voice typically reach -20 to -30 dB. Low background noise can typically be in the range of -50 to -70 dB. Note that this parameter will change from file to file. When checked, this enabled the slider controls to randomly change the Carrier Frequency. 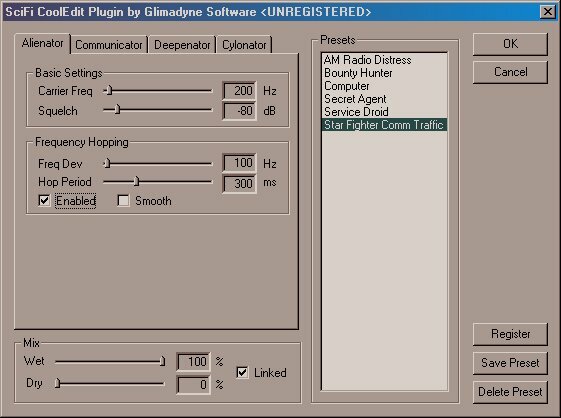 When unchecked, frequency hopping is disabled and only the carrier frequency specified above is used on the entire sound file. This slider determines the range (in Hz) from the specified Carrier Frequency that the next randomly chosen carrier frequency will be. The next frequency used to change your voice is randomly chosen in the range of carrier freq +/- freq dev. This corresponds to the carrier frequency "hopping" over this specified range, which gives an interesting time-varying effect. Increasing this value causes more fluctuations in your voice. This slider determines how often a new Carrier Frequency is randomly chosen (in milliseconds). The next frequency chosen is within the range shown above specified by the Frequency Deviation Slider. Making this slider smaller changes the frequency more often. Making it larger changes the frequency less. When checked, this applies a smooth transition when changing carrier frequencies. When unchecked, the transition is immediate. Provides some interesting warbling effects and can be used to create chirping noises.